If there are fewer than 1 vertical striped candy on screen, then the board spawns up to 1 when possible. If there are fewer than 2 horizontal striped candies on screen, then the board spawns up to 2 when possible. If there are fewer than 50 liquorice swirls on screen, then the board spawns up to 50 when possible. It will spawn 1 after every 4 moves. 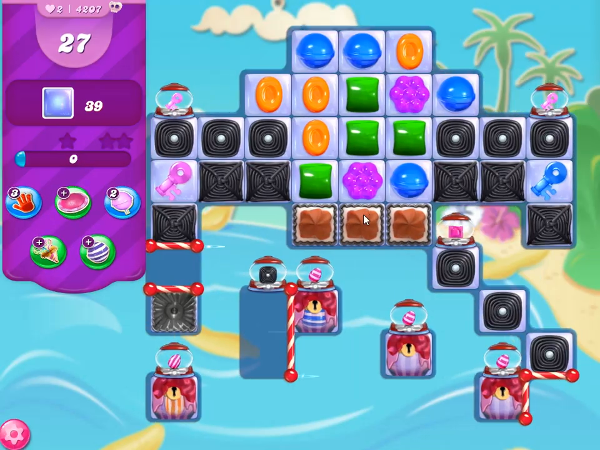 If there are fewer than 1 sugar key on screen, then the board spawns up to 1 when possible. First break liquorice swirls, icing blocker and jellies as many as you can. Then make lots of special candies and combine special candies to collect all keys to unlock sugar chest, to break locked liquorice swirls, more liquorice swirls, remaining icing blockers, more jellies and to activate striped candies to break remaining jellies to complete the level.